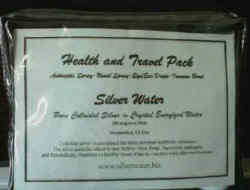 Colloidal silver is the strongest, safest broad-spectrum antibiotic known to man. It is non-toxic, non-addictive, and has no side effects. The silver particles in colloidal silver contain a positive charge that are attracted to virus, fungi, bacterium, pathogens and free radicals, all which contain a negative charge. When the positive silver ions attach themselves to the negative charged particles of disease in our bodies they quickly disable the oxygen metabolism enzyme suffocating and discharging (killing) the pathogens. The silver particles then release the pathogens and they are cleared out of body by the immune, lymphatic, and elimination systems. The body develops no tolerance to colloidal silver and one cannot overdose on it. It is safe for pregnant and nursing women. It is odorless, non-stinging, harmless to the eyes, harmless to human enzymes and healthy tissues, and has no reaction with other medications. It can improve digestion, aid in the regeneration of damaged cells and tissues strengthen the immune system, destroy pathogens and free radicals, help to prevent colds, flu and other diseases caused by bacteria, virus, fungus or parasites. Unlike antiseptics, it does not destroy tissues cells and may be safely applied to any part of the body, even the eyes. It is great for sick problems including sunburn, or radiation burns. Packaged in a personal care travel bag that conforms to the regulation size for airline carry-on luggage, this personal care travel bag is filled with one: 4oz immune boost bottle, 2 oz antiseptic spray bottle, 1oz eye/ear drops, and nasal spray bottle.